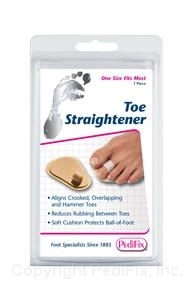 Reduce pain and friction associated with crooked, overlapping and/or flexible hammer toes with this comfortable slip-on pad. Adjustable loop gently encourages proper toe alignment while a soft, dual-layer cushion comforts the ball-of-foot area. 1 per pack.